Illumination: Design, gold & paint by Lady Adrienne d'Evreus; Whitework by me (Alexandre). So this scroll needs a bit of storytelling... A few years ago, Adrienne was at our local fish & game club, just leaving after some crossbow practice at their archery range. As she's driving out, a gentleman and his dog are walking up the road that loops around the range area. Adrienne - never one to let a safety issue at an archery range go unmentioned - stops to let him know that he should probably walk around the loop road in the opposite direction, as the direction he is walking puts him and his dog in a downrange arc to where she was practicing from. As they are having this conversation, a couple things happen. The man notices Adrienne's crossbow in the back seat of her car, and Adrienne is thinking to herself that he looks very familiar, though she cannot remember where from. He asks her "is that an SCA crossbow", and as they discuss it, they realize where they know each other from. He was her High School History teacher. Unbeknownst to her, he was also one of the founding members of our Province, but had retired from the SCA for several years. Due to this chance encounter, Deormund joined the Province again, and even volunteered to take on the position of our Archery Captain. 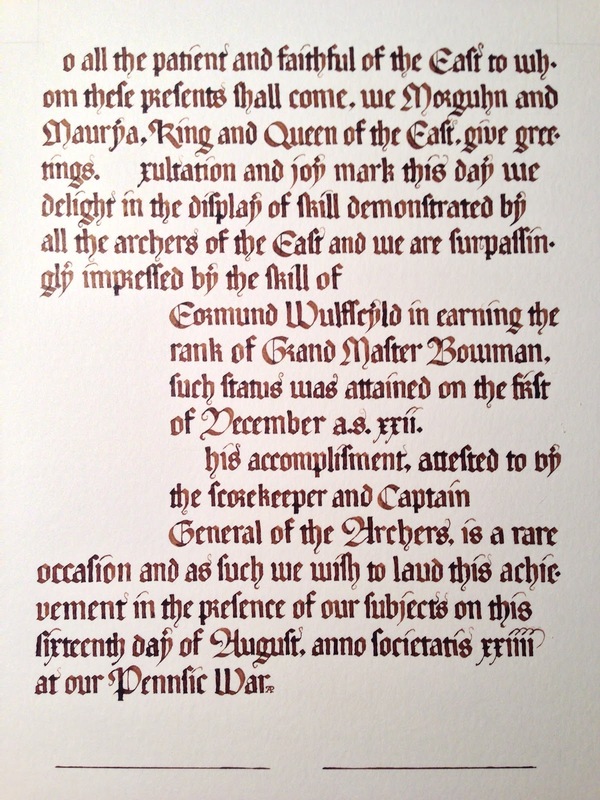 As we got to know him we learned that he had earned his Grand Master Bowman rank 27 years previously in a.s. xxii, but had never received a scroll when he was recognized for it in a.s. xxiiii! 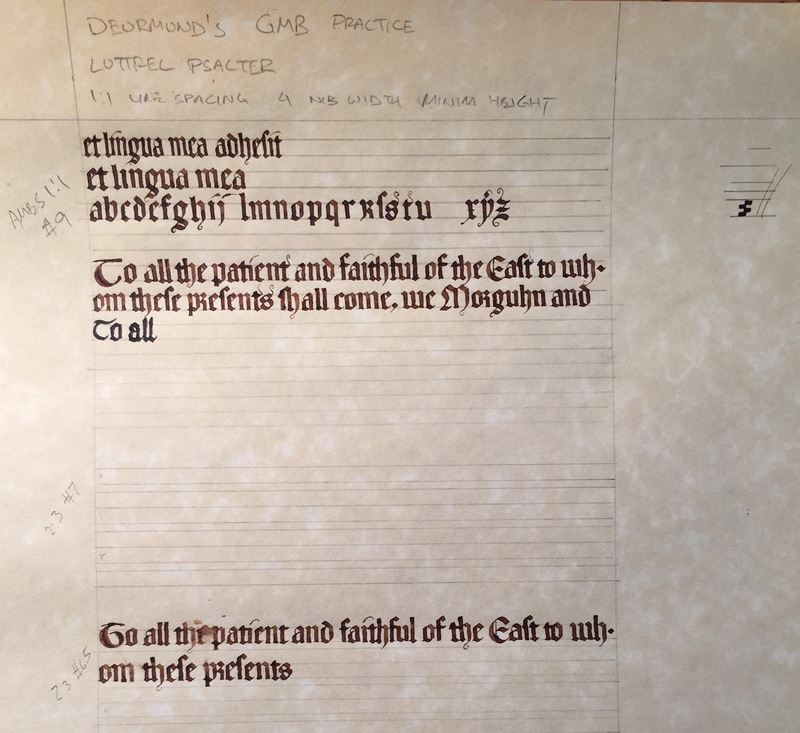 Adrienne and I volunteered to correct this, and learned from Deormund's wife that the Luttrell Psalter was a style he particularly appreciated. Adrienne designed the scroll, the four figures from the top left in clockwise order are "Messy" the Moat Monster (a target created by Deormund for the Great Northeastern War), Deormund, me (Alexandre) and Adrienne. 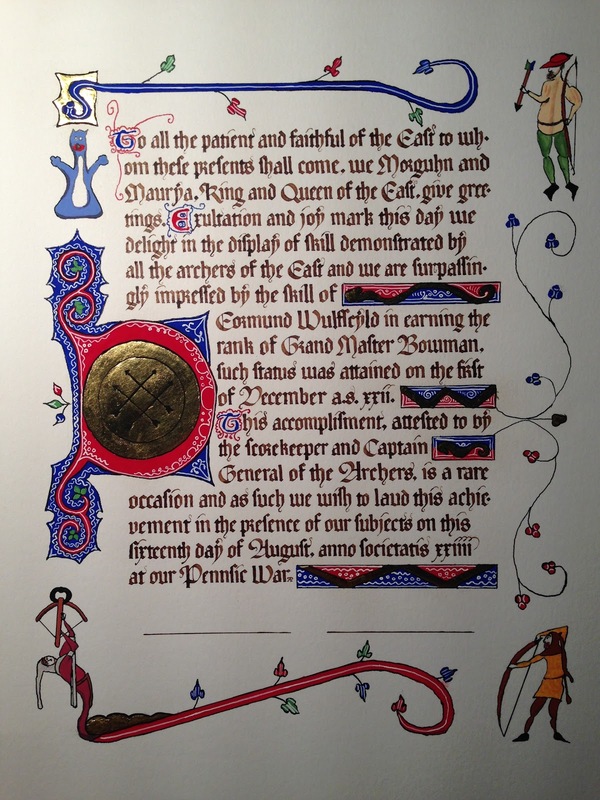 Adrienne arranged to have the scroll presented at the Archery range, and it was a very well received surprise. the hand and figure out line spacing.